It's a little known fact that Satanists are generally very jolly people. They're happy at breakfast. They're joyful at lunchtime. And they're exultant when they have to kill someone with a humongous axe. Yeah. Honestly. I saw it in this 90 minute movie made in 1964. It was Directed by Roger Corman; and Starred: Vincent Price, Hazel Court, Jane Asher, with David Weston. I know what the townspeople think of me. They think I'm a cold blooded murderer because I ordered my men to burn down their houses, plagued by the incorruptible 'Red Death'. But I'm not cold blooded, my friend. For I am the Satanist called Prince Prospero (Vincent Price). A very devilish Satanist who's currently in the process of perverting a peasant girl's Christian ways -- named Francesca (Jane Asher) -- by forcing her to choose who should live and who should die out of her father, Ludovico (Nigel Green), and her lover, Gino (David Weston). Admittedly, I don't allow Francesca to make her decision straight away. No. Of course not. First I get my hand-maidens to bathe her. Then I hold a masquerade ball in honor of my mistress, Juliana (Hazel Court). And that's when I... errr... how can I put this? Oh! I know. I allow time to gestate. Time to show Francesca that nothing is as it seems. Not multi-colored rooms tinged with emotion. Not biblical slanted nonsense stained in blood. And never, never, never, hallucination or dreams guided by an unseen hand wafting within the breeze during the night. Still. That's most probably why what next transpires all turns red when a dwarf and a mistress hatches some plans of their own. As a decision is finally made - a monkey is ultimately flayed - townspeople are shown the door - and at the end of the day a lonely robed figure wanders about, along a bloodstained banqueted floor. 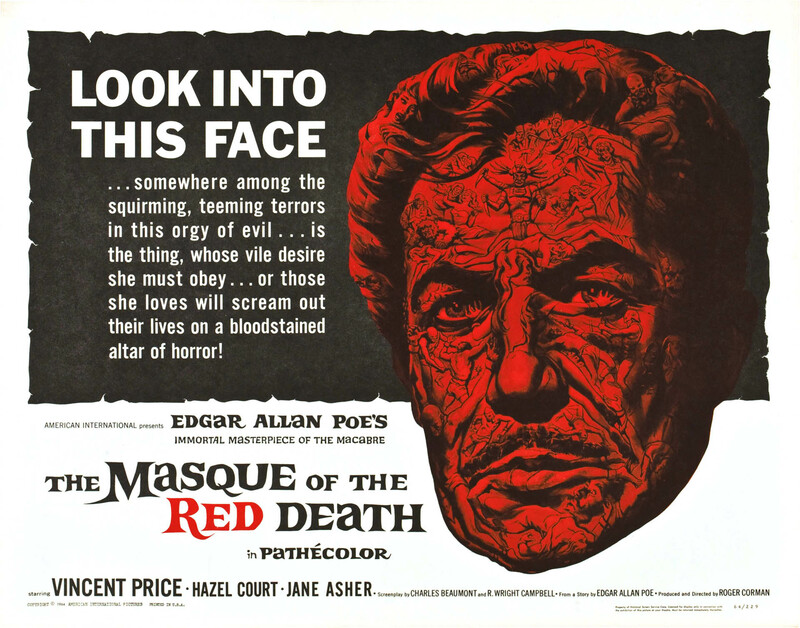 To be absolutely honest with you, folks, I'm not entirely sure if I liked 'The Masquerade of the Red Death' or not. On the one hand a part of me really did warm up to its timely charms. As it had that way about it that just screamed class in a can for me. Whilst, on the other hand, there was another part of me that is slightly uncertain if the narrative structure held the film together as a whole. As there were a couple of moments scattered throughout this piece, which never appeared to go anywhere in retrospect. Now the sections I'm referring to are those two sub-plots abutted within. The one with the dwarf in it, and the other one with the mistress in it. For yours truly, they didn't complement or enhance the central plot one little bit. What they did instead was allow 'other things' to transpire, despite diluting the principal theme of this tale. Yes. That's correct. I'm talking about the concept of perverting one person's will within a baroque and medieval landscape. Personally speaking, I thought this topic of note was a great one to explore in cinema. Due to the fact that it's something we see nigh on every day in our own current semi-political climate. Well, let's face it; forcing people to behave in a way that is not akin to the norm is very commonplace nowadays. Just look at the telly, the media, or the newspapers. And tell me that some of what you see is wholesome or pure on a visceral or emotional level. It's not. Is it? Still, such is life I suppose. Life garnished with your ever loving filmic-facts. (1) 'Anglo-Amalgamated' first released this production in America, on the very same day that health warnings were first placed upon cigarette packets -- the 24th of June, 1964. (2) On a conceptual level the premise behind this picture derived from three different sources. The main source was from an Edgar Allan Poe 1848 short story of the same name. The second source was from another Poe tale called 'Hop Frog'. And the third source was drawn from Auguste Villiers de l'Isle-Adam's book, 'Torture by Hope'. (3) Apart from those scenes shot in and around London, most of this movie was shot at 'Elstree Studios', Borehamwood, England. (4) If you thought some of the sets in this flick looked familiar, that's most probably because Roger Corman utilized the left over sets used in the Richard Burton, Peter O'Toole, and John Gielgud, 1964 classic, 'Becket'. (5) Loosely translated, this project was entitled 'The Bloodthirsty' in Sweden; 'The Red Death Mask' in Hungary; and 'The Devils Pet' in Finland. (6) When Jane Asher asked Roger Corman if her boyfriend could join them on the set for some lunch, he didn't know that the person she was going to bring was Paul McCartney from 'The Beatles'. He was shocked. He never knew who Jane was dating at the time. (7) This was the last film ever broadcast on WNEW Channel 5's 'Drive-In Movie' program. The date was the 2nd of July, 1988. (8) Could you translate the last words spoken in this film into English? 'Sic transit gloria mundi'? If not, they mean 'thus goes the glory of the world'. 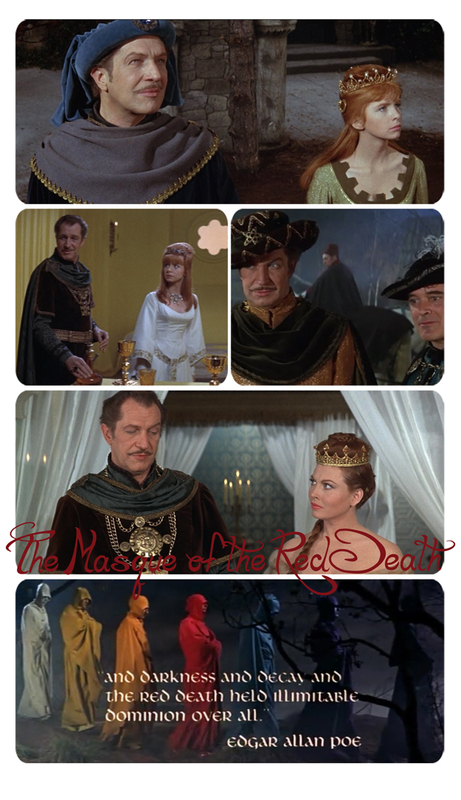 Now the last thing I'd like to mention about 'The Masquerade of the Red Death', would be how all of the actors in it are just great to watch. 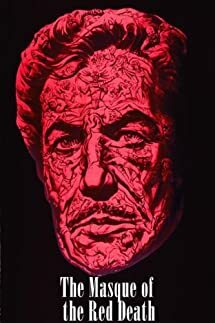 Especially my pal, Vincent Price. My God! He really does play a right b*stard in this film. Exhibiting all of his mannered glory, in spite of Jane Asher's and Hazel Court's cleavage being on show whenever the moment arose. Also, something else I want to say about this flick, is how the color pallet utilized, complemented the baroque nature of this yarn. Cosmetically the sets were bright and vivid, and the character costumes dull and muted. Or in contrast the opposite was sometimes additionally true. With the character costumes bright and vivid, and the sets dull and muted. Not that this is a bad thing of course. It was just worth mentioning is all. Just like how it's worth mentioning that this is a pretty decent movie . With great actors. A so-so story-line. Plus a way about it that's pure class in a can.